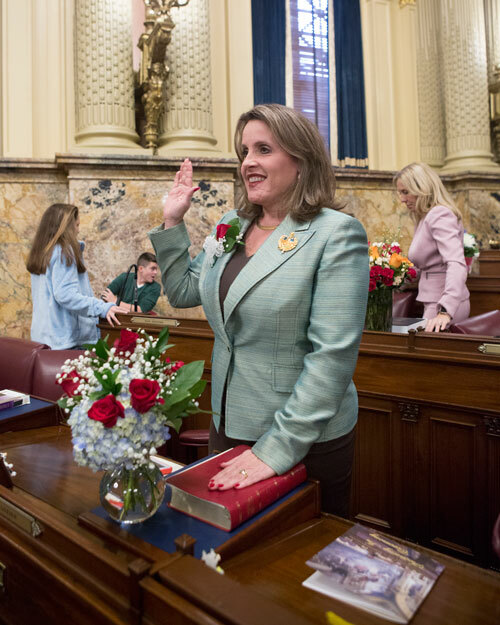 Joined by family and friends, Rep. Sheryl Delozier (R-Cumberland) today took the oath of office to represent the people of the 88th District in the Pennsylvania House of Representatives. HARRISBURG – Rep. Sheryl M. Delozier (R-Cumberland) today took the oath of office to begin the 2017-18 legislative session in the state House of Representatives. With this ceremony, Delozier begins her fifth two-year term in office. The day’s proceedings also included the formal election of House Speaker, as well as voting on rules to govern the legislative body for the next two years. Delozier’s Lower Allen district office is always available to address residents’ questions and concerns about state government. It is located at 2929 Gettysburg Road and can be reached by calling 717-761-4665. Residents also can reach her at her Capitol office via telephone at 717-783-5282. More information is available on Delozier’s website, RepDelozier.com and her Facebook page at Facebook.com/RepDelozier. There visitors will find information on the latest legislative developments in Harrisburg state programs and the latest happenings in the 88th District.